I am creating an Application which will run on all Android Devices. I want to create xhdpi Graphics for My App. My App is full screen. I am confused in Creating graphics. can any one tell me the best sizes of my background image in pixels. Suggest me the best sizes which will appear on all devices good. Because my graphics are the core of my app. I want that every device get the best image which it want. Android will be not involved in compressing or expanding of image. I looked around the internet for correct dimensions for these densities for square images, but couldn't find anything reliable. GIMP tool is exactly what you need to create the images for different pixel resolution devices. Open the existing image in GIMP tool. Go to "Image" menu, and select "Scale Image..."
Then "Export" the image from "File" menu. Keep to the 3:4:6:8:12:16 scaling ratio between the six generalized densities (ldpi, mdpi, hdpi, etc). 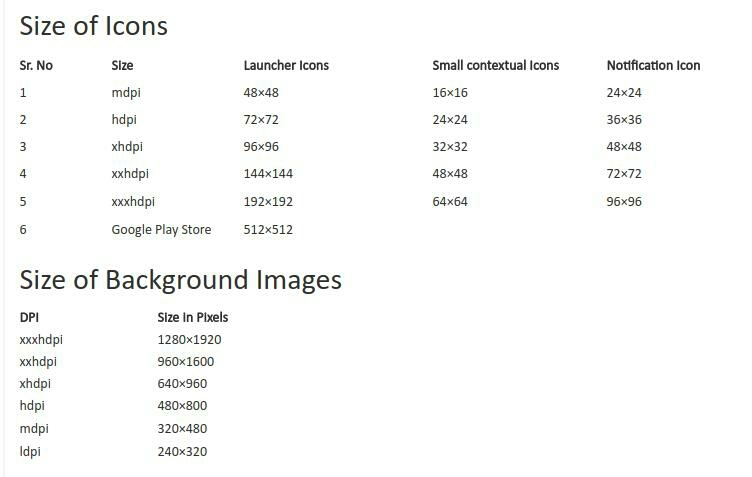 You should not include xxxhdpi elements for your UI elements, this resolution is meant for upscaling launcher icons only (so mipmap folder only) ... You should not use the xxxhdpi qualifier for UI elements other than the launcher icon. ... although eg. on the Samsung edge 7 calling getDisplayMetrics().density returns 4 (xxxhdpi), so perhaps this info is outdated. This corresponds to an xxhdpi screen. From here I could scale these 1080 x 1920 down by the (3:4:6:8:12) ratios above. I could also acknowledge that downsampling is generally an easy way to scale and thus I might want slightly oversized bitmaps bundled in my apk (Note: higher memory consumption). Once more assuming that the width and height of the pixel screen is represetative, I would scale up the 1080x1920 by a factor of 480/441, leaving my maximum resolution background image at approx. 1200x2100, which should then be scaled by the 3:4:6:8:12. Remember, you only need to provide density-specific drawables for bitmap files (.png, .jpg, or .gif) and Nine-Patch files (.9.png). If you use XML files to define drawable resources (eg. shapes), just put one copy in the default drawable directory. If you ever have to accomodate really large or odd aspect ratios, create specific folders for these as well, using the flags for this, eg. sw, long, large, etc. Not the answer you're looking for? Browse other questions tagged android graphics or ask your own question. How does pixel density correspond to screen size? Eclipse emulator dpi can not be set over 320dpi ? How mdpi, hdpi, xhdpi folder works?